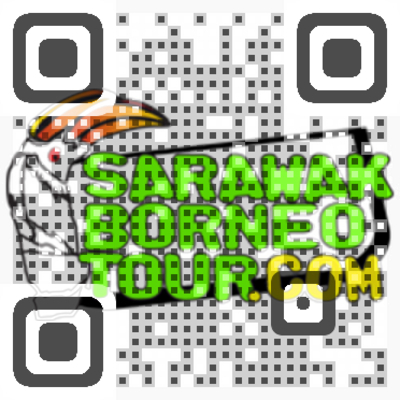 - A visit to the Mulu World Heritage Area is a journey into the interior of Borneo. - Our team arrived at Mulu National Park entrance, and we walked about 1.8 km along the wooden walkway towards the caves before proceeding to the Canopy walk. -The Canopy Walk at the Mulu National Park is the longest tree-based canopy walk in the world with a distance of 480 meters long. Located in the state of Sarawak in Borneo Island, this hard to access park is one of the must see attractions in this region if you are a nature lover. -They have some rules you have to follow when walking on the suspended walkway. There should only be two people maximum walking at any one time on each walkway. The walkways are connected to trees and they have a station at certain pit stops. -The height is between 30-40 meters from the ground. I do not recommend this to those who are afraid of heights...once you start there's no turning back. -From a jungle clearing, we watched millions of bats, streaming out from the cave heading towards the thick density of the jungle. They formed a long continuous line, flexing and coiling like a serpent. 1- Sungai Merah Heritage Walk - The earliest Foochow settlers landed here when they arrived in 1902. Sungai Merah (Red River) is an old bazaar about 10 min from Sibu town centre where this township started. Wong Nai Siong Memorial Garden, erected in honour of the town’s principal founder. Seen here is a bronze statue of Wong Nai Siong (from Dynasty Qing). 2- Majority of the coffee shops in Sibu City Centre are opened by the Chinese. We were introduced to local food & drinks e.g. Sarawak laksa, kampua noodles, wheatgrass drinks and 3 layer tea. Coffee shops cab be found at almost everywhere (lorong). We found out that there is a traditional kompia pancake maker at an old traditional shop which is passed down by their forefather. 1- We went to Sibu Central Market, the biggest indoor market in Malaysia, thousands of stalls selling everything from fresh vegetables and fruits to live poultry. We saw exotic foods from the ethnic group being sold here. 2- I learned and experienced how to make kompia from the kompia baker. He bakes around 5000-6000 pieces because of the high demand from the local people. 3- We tried the BBQ deer meat. We saw how the chicken seller wrapped live chicken with newspaper. Buah Petai, a type of vegetables is good for kidney. 1- We found out the “KASAM”, ethnic dish sold at the Sibu Central Market is actually pork preserved in salt, in Iban language they call it “KASAM”. This is a type of traditional food of the natives of Sarawak. After the food is preserved for around a week or so, it is then ready for consumption. Some said it is delicious, others said it tastes awful. Generally, it is OK. And yet the natives themselves find it delicious. 2- The heart of palm is used to cook soup by the natives of Sarawak. I-Walker Team was expecting it to be very blend and dry but it turned out to be extra light and tasty. The “Umbut” is actually the flesh of palm, whereby the palm tree has to be chopped down for the “Umbut” to be harvested. 3- We were shown “tupat” which is wrapped with rice, used mostly for prayers, ceremony and festival. clothing or undies to bring such misfortune. and found that it is not as easy as it seems.